Mark your calendars! BAMFest 2018 is scheduled for Saturday, October 13. 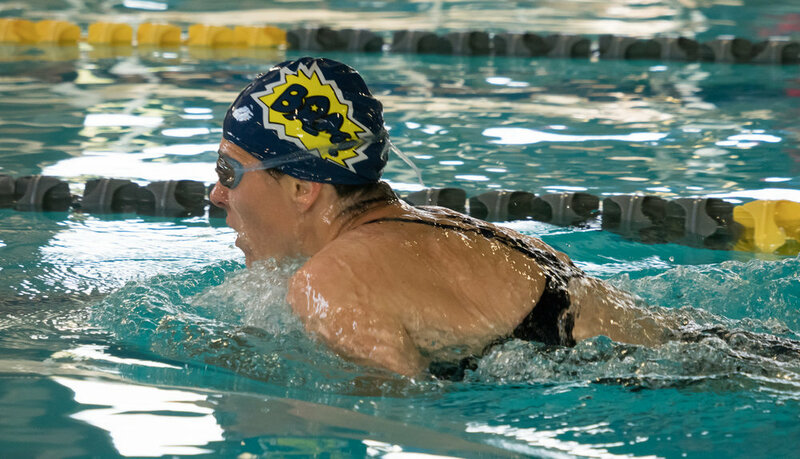 BAMFest is an annual fundraiser for Bainbridge Aquatic Masters, a short-course Master's swim meet held in October of each year. We're proud that our meet gets kudos from meet referees, officials, athletes and coaches because we work hard to provide a welcoming, respectful and fun environment. The Bainbridge Island Aquatic Center is on Madison Avenue about a block north of High School Road. The address is 8521 Madison Avenue. There are two indoor pools: Ray Williamson Memorial pool is a 25-yd, six-lane pool used for competition. Additional lanes in the Don Nakata Memorial pool are available for continuous warm-up. Located within easy walking distance of the pool, across the street from Safeway and a few eateries. Located just a mile or two from the pool, and central to our beautiful downtown area with shopping, restaurants, art galleries and views of Eagle Harbor and the marina. Located within walking distance of the pool, near Safeway and a few restaurants. Located on State Highway 305, at the Agate Pass bridge. Call 800-375-6073 for reservations. There is a courtesy shuttle from the ferry. Part of the fun of coming to BAMFest is taking a ferry ride from Seattle. Some think it's a good time to get some leisurely stretching in before the races - others prefer to nap.